Create a series of Christmas Tree ornaments that can be folded flat for storage or mailing. This tutorial is for the star, snowflake or Nativity cutting file, and may be others if I keep designing more. The assembled cube is 2 7/8" cubed. You can add glitter and ribbon for holiday bling. Construction techniques are basic beginner 3d techniques. There is a video of the assembly below. Scroll to step 5 to start watching. File layout for the Nativity Cube Shadow Box Ornament by Marji Roy of 3dcuts.com. File layout for the Snowflake Cube Shadow Box Ornament by Marji Roy of 3dcuts.com. 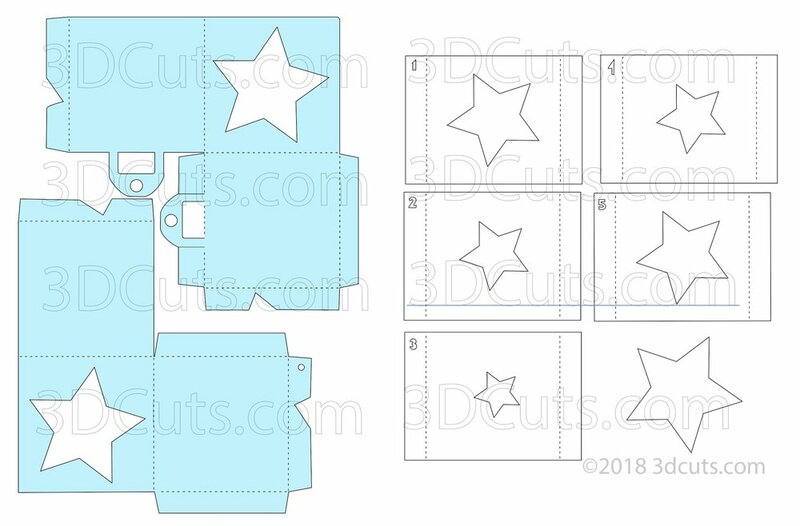 File layout for the Star Cube Shadow Box Ornament by Marji Roy of 3dcuts.com. All pieces are cut from card stock. I used solid dark colors for the cube and white for all interior layers. The assembly steps are detailed in the video below. Here is the YouTubeurl https://youtu.be/oU3bi3_ygdQ. This video covers the directions for all three designs. They all go together the same way and you must pay attention to orientation of the pieces. It does matter! You have the following choices which are all covered in the video. Glitter or no. It is optional. Glitter application method- With spray glue (faster) or with art glitter glue - (more controlled). Both are demonstrated in the video. To fold flat or not. You can adhere all the flaps in place during construction which will make for a stronger cube but then you will not be able to again fold it flat. Or you can use ribbon to tie the cube together and again fold it flat for storage during the off-season or mail it as a Christmas Card. 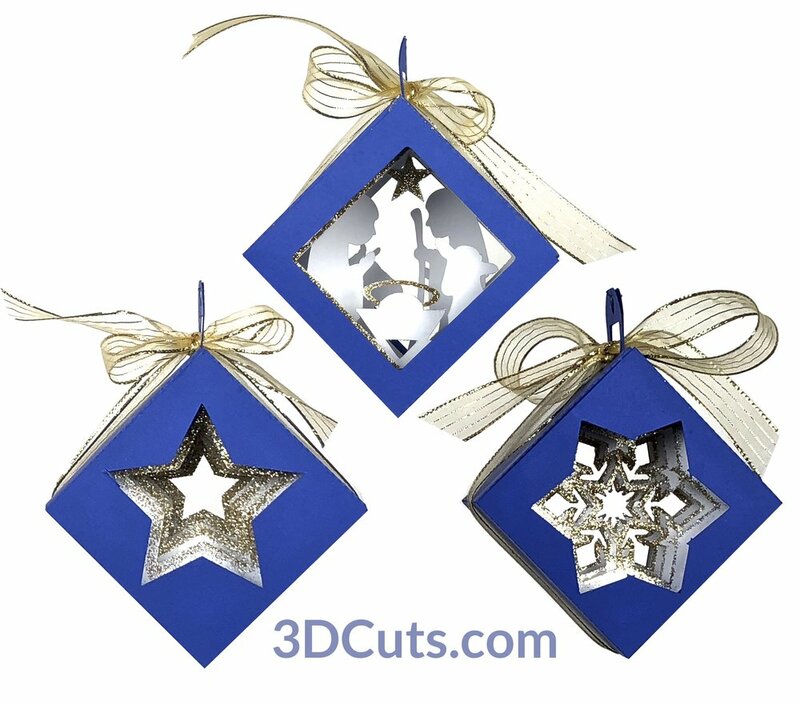 This ornament is designed to fold flat for storage or to be mailed in a 6" x 9" booklet envelope. There is an affiliate link in the supplies above for ordering them from Amazon.